Coupons.com employees Jason Tinnons and Curt Quentien, top, and Shannon Clark, bottom left, and KaBOOM! project manager Courtny Dolan, bottom center, install a train-shaped playground structure along with about 450 other volunteers from the two companies and surrounding community at Bell Street Park. The group of volunteers installed a brand new playground, picnic benches, shade overhangs and two murals in one day on Aug. 20, 2014. Photo by Veronica Weber. At the crest of the Highway 101 overpass in East Palo Alto, a glimmer of bright orange and lime green peeked through the distant redwoods at Bell Street Park on Wednesday. Just one day earlier, the lot stood empty, save for some concrete foundation. The vibrant colors are the harbinger of a new 4,000 square-foot playground -- constructed by volunteers Wednesday in all of six hours -- that will give more than 3,200 children a new place to play. 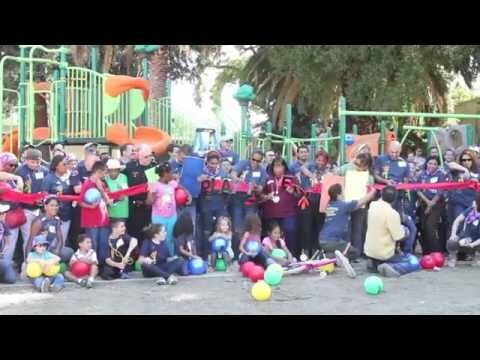 The "Build Day" event was the culmination of six months of planning for the project, the product of a partnership between the City of East Palo Alto, the YMCA and KaBOOM!, a national nonprofit that helps communities in need of new play spaces build them by connecting them with local donors. KaBOOM! helped the city secure funding and support from Mountain View-based retail savings company Coupons.com. After a kick-off ceremony at 9:30 a.m. Wednesday, volunteers divided and conquered, assembling each element of the play structure in teams. Other tasks included construction of wooden arbors, benches and picnic tables, as well as mixing cement, transporting mulch and painting two new murals. About 150 volunteers from Coupons.com joined East Palo Alto residents, city employees, police officers, and members of the nearby senior center to complete construction by 3:30 p.m.
Cynthia Bojorquez, East Palo Alto's community programs manager, said the new playground at 550 Bell St. will not only give kids a safe, exciting place to play, but will also transform Bell Street Park into a diverse, multi-generational family space. Tree cover and ample seating will make the park more welcoming to seniors, while the playground's rubber surfacing (to be completed later this month) will make the play space accessible for kids of all abilities, she said. "The mural really represents the vision for the park," Bojorquez said of the artwork painted that day, featuring culturally and racially diverse individuals and motifs. The bright colors of the play structure, chosen by children during a "Design Day" held in June, speak to the positive and healthy environment that she believes the park will create  and has already been created in part by the spirit of the volunteers. "Everyone has done what they could," Bojorquez said. "It's like an old-fashioned barn raising." Rich Hornstein, a volunteer from Coupons.com, remembers arriving at the site, "seeing that there was nothing," and then walking away at the end of the day, being able to see all the work accomplished in one day. The project created community among volunteers as well, he said, having spent a large portion of the afternoon mixing concrete with Lisa Yarbrough-Gauthier, vice mayor of East Palo Alto. "To have this park being brought back to the community like this … it's just wonderful," Hornstein said. The construction of the playground will also enhance existing city programs such as Fit Zone, a police department-sponsored fitness program that holds free fitness classes at city parks. To Melvin Gaines, the police department's grant program manager, Bell Street Park will no longer be just a place that class is held. "Now, it will be a destination," he said. "It's great to see the fruits of our labor. We'll soon be out here doing Fit Zone, and we'll be able to look over here and think, 'Hey, we built that.'" Bell Street Park is currently the main venue for city events and festivals, often coinciding with holidays. With the construction of the new play space, KaBOOM! project manager Brenna Hull believes that the park will become "not just a three-times-a-year family place, (but) an everyday family place." "People from all walks of life will use this space," Interim Chief of Police Steve Belcher said. "It will be a safe place for the community to gather." East Palo Alto resident Casey Jackson enjoyed "seeing the community come together" to complete the park's transformation. "It's a change that's been long needed," he said. After multiple cheers, hugs and high-fives among volunteers during a ribbon-cutting ceremony to celebrate the playground's completion, Coupons.com co-founder Michele Boal remarked, "It's truly the power of we." The playground will officially open to the public on Saturday, Sept. 6, with a grand opening event at 9 a.m.
Watch a video of Wednesday's event. Congrats to EPA and the volunteers that worked on this project!! Palo Alto should hire the planning people from this project for future projects - They may have had the Mitchell Park Library done in a year!! What a great effort. Just goes to show what some organization and grit can accomplish. All these volunteers who came together to make this playground happen in one day should be so proud of what they've done for the children and the community. Impressive! Wow! Great news and thanks to all the volunteers for this community effort. Maybe Palo Alto could hire them to complete the 9 YEAR study of single traffic light. Bet Mitchell Park Library wouldn't have been 2 YEARS late with them. Hope the drug dealers do not take over as they did before. Police should make many rounds to keep them away so kids have a safe place to go and play. Bein an EPA resident for many years, this brings me joy to know that East Palo Alto has and will continue improving in many ways. Thank you to the volunteers who came together to make this playground possible. Looking foward to have my children enjoy this wonderful park! The community is invited to join us as we celebrate the grand opening of the new Bell Street Park Playground and Mural unveiling on Saturday, September 6 from 9-10:30 a.m. Now complete with slides, swings, climbing walls, shaded rest areas, picnic tables and vibrant artwork, Bell Street Park is a picture perfect play space for the entire family. Come out and play in EPA as we take this opportunity to thank KaBOOM!, Coupons.com employees and the hundreds of EPA residents whose hard work made this project happen! For more information, contact Cynthia Bojorquez at 650.853.3153.